Most people are familiar with the creative side of Adobe's business, now known as Adobe Creative Cloud. Others aren't as familiar with Adobe's other side of the business -- focused on marketing -- and known as Adobe Marketing Cloud. Each of these powerhouse "clouds" if you will, meet annually at a big conference. For the creative folks, it's Adobe MAX. For the marketing folks, it's Adobe SUMMIT. A popular segment at each of these conferences is called "sneaks" where Adobe engineers will show some of the cool things they've been working on. 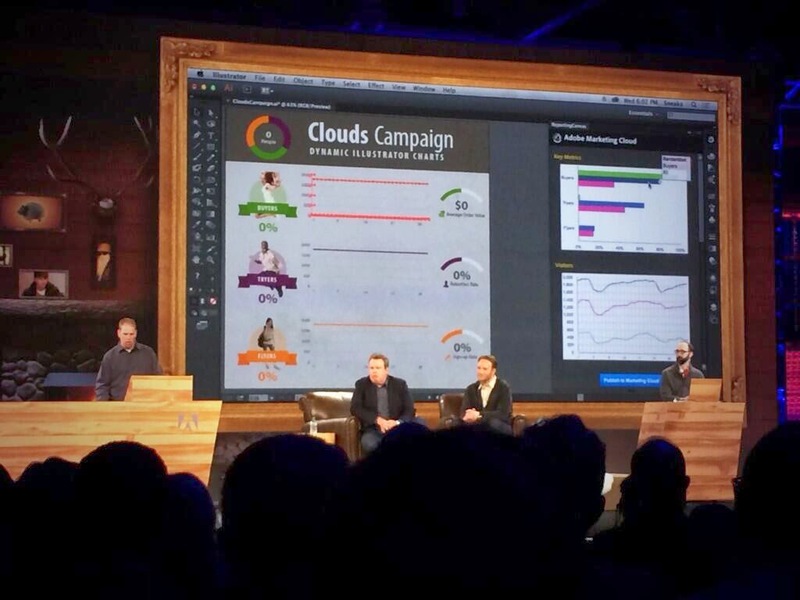 The Adobe SUMMIT 2014 conference is going on right now in Salt Lake City, and last night, they had their Sneaks session -- and they showed some technology they are working on that allows you to use a template from Illustrator and overlay real-time data to create what they dubbed "AutoInfographics". For a good while, AutoInfographics was trending on twitter (it *is* after all, a marketing conference). From the screenshot above, you can clearly see it running in Illustrator. And it looks AWESOME. Any more info on how this thing operates? My office would LOVE this. I hope Illustrator’s graph tool gets an overhaul in the near future because it’s one of the oldest in the app and has not been revamped.